References abiDialogSetTitle(), XAP_App::getStringSet(), XAP_StringSet::getValueUTF8(), localizeButtonUnderline(), localizeLabelMarkup(), XAP_Dialog::m_pApp, m_tvFormats, newDialogBuilder(), s, and s_date_dblclicked(). References CURRENT_DATE_TIME_SIZE, InsertDateTimeFmts, m_tvFormats, m_windowMain, time, and UT_ASSERT. 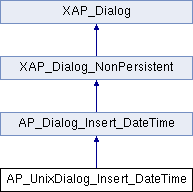 References AP_Dialog_Insert_DateTime::m_answer, AP_Dialog_Insert_DateTime::m_iFormatIndex, m_tvFormats, m_windowMain, and UT_ASSERT. References _constructWindow(), _populateWindowData(), abiDestroyWidget(), abiRunModalDialog(), CUSTOM_RESPONSE_INSERT, event_Insert(), AP_Dialog_Insert_DateTime::m_answer, m_windowMain, and UT_return_if_fail. Referenced by _constructWindow(), _populateWindowData(), AP_UnixDialog_Insert_DateTime(), and event_Insert(). Referenced by _populateWindowData(), AP_UnixDialog_Insert_DateTime(), event_Insert(), runModal(), and s_date_dblclicked().